A true punk has a the coolest of cool punk hairstyles, the punk rock hairstyles for men – the Mohawk. Ladies – you can have a mohawk OR a chelsea. But the mohawk is the punk rock hairstyle for men. The Insta Punk Kit comes with explicit instructions (we are all naked!) 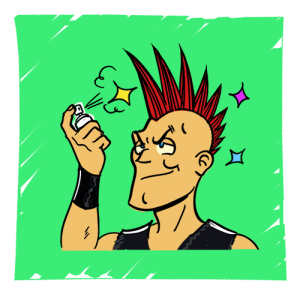 on how to accomplish a mohawk and have a truly cool punk hairstyle. Shave both sides of the head, keeping only a strip of hair on the top. Think of a skunk. You only want the white. Damage the hair. Whether this be through bleaching (which is recommended to accomplish hair coloring) or letting the dog pee on it, all is good. Slop hair color on it. The punk hair colors are : Green, Dark Blue, and Orange. DON’T WASH HAIR! 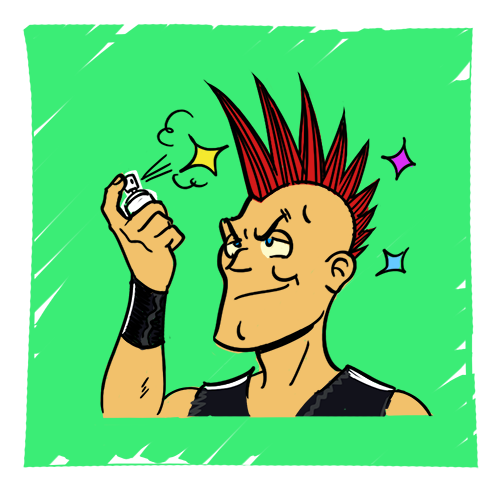 Once the hair has dried with the hair color on it, bend over and start to apply the gel provided in the Insta Punk Kit. Slowly mold hair into desired number of spikes. Add more gel. Stay upside down until hair dries. Spray generous amounts of Aquanet. Don’t let your friends see the can of Aquanet, as it is primarily an 80’s Goth tool. But the stuff works. Straighten back if possible. Walk out of room and show your punk hair to your parents. If they are shocked, go outside and play. If they like it, go take a shower.